Mrs. Frisby, the leader of the field mice, lives underground with her four children, Timothy, Cynthia, Martin, and Teresa. Her son Timothy, is sick and she has to bring him to Mr. Ages, the doctor who lives on the other side of the farm. She took Timothy to see Mr. Ages and after Mr. Ages found the problem, he cured Timothy. Mrs. Frisby came back in the morning to get medicine for Timothy. On the way home she met a crow named Jeremy whose foot was tangled by wire and she helped him untangle. Jeremy thanked Mrs. Frisby and told him that whenever she needs help, he will try his best to help. Soon, the farm was under construction and they have to move, but they only have the time limit of five days to move. Jeremy took Mrs. Frisby to see the owl in the forest to ask for help about how to move, and the owl told them to see the mouse of NIMH. The mice of NIMH are rats that have special abilities such as abilities to read and write. The rats of NIMH help Mrs. Frisby move and now they are making a plan of escaping from the scientists. When I first saw the book, I thought it will be an interesting book to read. The author did use a good choice of vocabulary and some vocabularies are ones I learned in class. Throughout the whole story, every main point is described with many details, but the only weakness is that a few parts of the story is confusing and takes time to understand. Also, the start of the story was boring because the first two to three chapters are about Timothy’s sickness. If I went back in time, i would read this book because the story was pretty interesting. I think the age group ten years old to thirteen years old would enjoy this book. At the end it was sad because after all the time the rats of NIMH and the field mice spend together, Mrs. Frisby has to leave until next winter. Overall, I would rate this book eight out of ten stars. 1. Who healed Timothy’s sickness and how? 1a. Timothy did a surgery done by Mr. Ages and healed. 2. When they test the experiment on the rats, what abilities can they get? 2a.They can be smarter and possibly, they will be able to read and write. 3. How did Mrs. Frisby meet Jeremy? 3a.She met him on the way to Mr. Ages’ home and saved him so they became friends. 4. How did the rats get into the rose bush? 4a.They made a tunnel underground that leads to the rosebush. 5a.Mrs. Frisby is a field mice and a widow because her Husband Jonathan was killed by the farmer’s cat, Dragon. 6. Why was it hard for Mrs. Frisby to go see Mr. Ages? 6a. On the way to the house, there are wild animals, the rat’s predators. 7. When is the Family moving and why? 7a. They are moving at the end of winter because the farmer’s area where they live is under construction. 8. Why was Timothy not feeling well? 8a. There was a huge spider stuck in his body. 9. Who took Mrs. Frisby to see the owl and how? 9a. Jeremy took Mrs. Frisby to see the owl and he carried her on his back. 10. Why did Jeremy hesitate to take Mrs. Frisby to the owl? 10a. 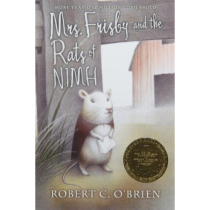 He hesitated because Mrs. Frisby is a rat, which is an owl’s prey so he is afraid the owl would not help Mrs. Frisby. 11. What specific types of toys are in the toy box? 11a. There was automobiles, trucks, windmills, airplanes, boats, and merry-go-rounds. 12. Where did Mrs. Frisby bump and what happened afterwards? 12a. She bumped into a metal stool and afterwards, she fainted. 13. Why did the Fitzgibbon family not want to keep the rat? 13a. They said that rats are hard to take care of and that they might have rabies. 14. Why did Mrs. Frisby want to go home? 14a. She wants to go home because it is comfortable there and she can be with her family. 15. Who saved Brutus and how? 15a. Mr. Ages and Mrs. Frisby saved him by finding an antidote and feeding him it.